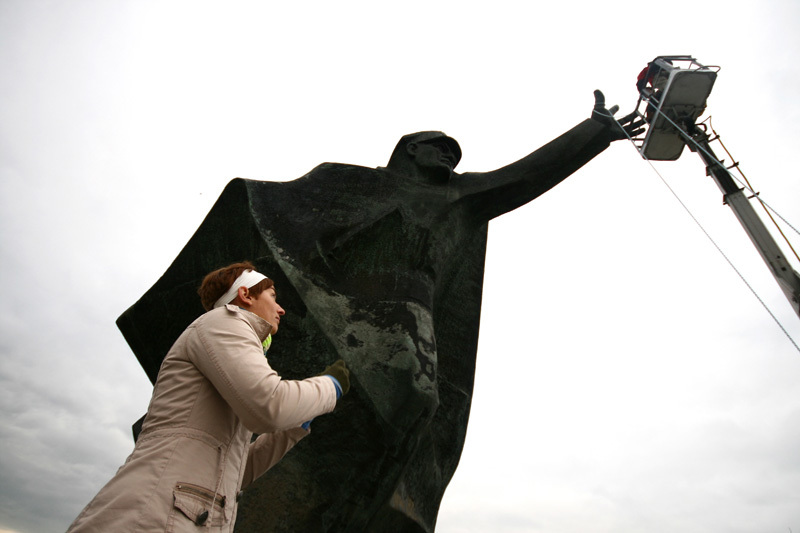 Kamila Szejnoch makes artistic interventions in public space. She is absorbed by the history, symbolism, and ideology of places, and her interventions can change the meaning and function of the space, or an object located in the space. Karuzela zjeżdżalnia huśtawka (Carousel Slide Swing) consisted of changing the functions of now-discarded “dead” monuments of Warsaw’s urban space. For one of the interventions, Szejnoch exploited the shape of a monumental statue commemorating the Kościuszko 1st Warsaw Infantry Division, transforming it into a swing. The action was not only a method of rewriting history and the meanings hidden behind it, but also an attempt to treat the monument as a non-artistic object, an ordinary metal construction that could be used for play (see: artistic competence). This dialogue with monuments that are situated on the “dust heap of history” can be a strategy for removing them from the field of art, making use of them in a manner consistent with a returned found object, where prosaic use disarms an object of its autonomy (see: conceptual edifices). In a world of regulated behaviours toward artistic objects, strategies of this type can encounter social resistance; the police rapidly intervened in Swing. The report presented in exhibition consists of one photographic print of the artistic action Karuzela zjeżdżalnia huśtawka licensed by the Museum of Modern Art in Warsaw for the duration of exhibition. Photo courtesy Wojtek Józefowicz.